North Sound, Grand Cayman, Cayman Islands. Ever pet a stingray in an aquarium? How about petting a few dozen while wading in the Caribbean? 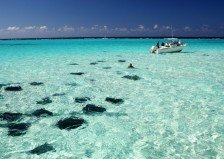 The Stingray City Sandbar is one of the top Cayman attractions and a must-do on your Grand Cayman vacation. Stingray City is home to a whole fleet of southern stingrays who congregate near the shore. The stingrays began gathering in the area decades ago when fisherman used to clean fish on the shallow sand bars. The stingrays would forget their normally shy dispositions and feast on the guts of the cleaned fish. Soon the stingrays began to associate the sound of a boat motor with food. In the late 1980s, divers started feeding squid to the stingrays, one of their favourites. Today, Stingray City is a readily accessible, once-in-a-lifetime experience for anyone who wishes to see one of nature’s most majestic creatures up close. As you enter the clear waters, the graceful southern stingrays glide tranquilly past in their natural habitat. Experience the majestic wildlife of Grand Cayman diving, standing in only three feet of water. 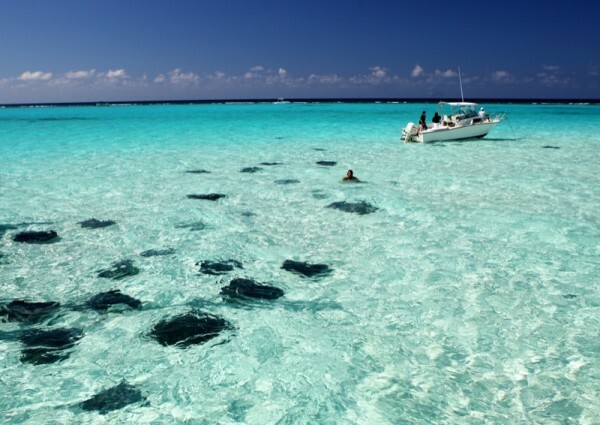 At any time, you could be surrounded by more than two dozen friendly stingrays. An experience in Stingray City is unlike any other brush with sea life and is sure to make your Cayman Islands vacation unforgettable.